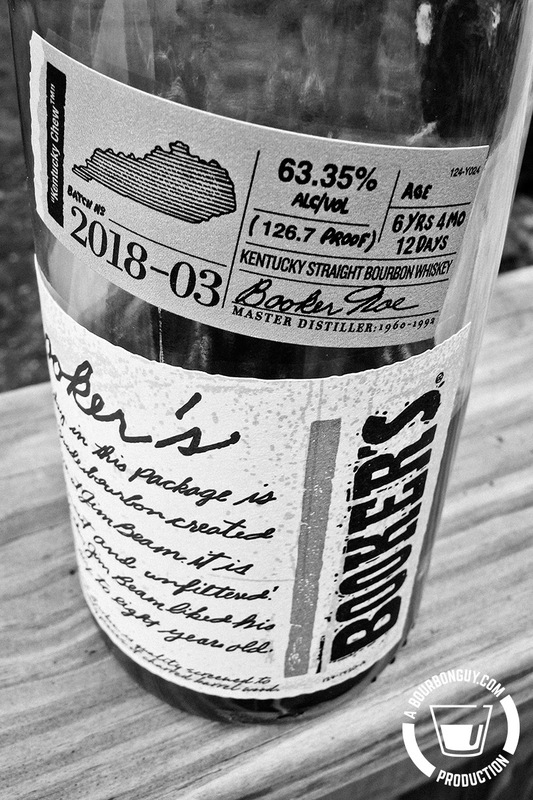 Booker's Bourbon: Batch 2018-03 "Kentucky Chew"
It’s the last post of Bourbon Heritage Month. Tonight we finish up the month by revisiting a bourbon that was provided to me specifically to coincide with Bourbon Heritage Month. I state in my Statement of Ethics that if I accept a review sample, I will disclose it at the beginning of the article. Please consider it disclosed. I’d like to thank Jim Beam for providing this sample to me with no strings attached. As always, all thoughts are just my opinion and should be taken as just that. Do you ever get the feeling that life is flying by? That maybe life is too short to hold grudges? I do, and I have for a while. For some reason, that doesn’t seem to stop me from holding a few grudges anyway. Which seemed odd to me, until I come to the realization that I’d been hiding the grudge, even from myself. Let me set the stage for you. It was 2016. I, like many bourbon lovers, had been getting frustrated by the rising prices and disappearing age statements for a while. It felt like one punch in the gut after another as one previously affordable bourbon after another either disappeared, lost their identity (age), or just plain became priced out of reach. Affordable luxury was how I, and many others, had always thought of bourbon. And then the announcement of the 2017 Booker’s Price Increase (from $59.99 to $99.99) came. There was understandable anger. It had been communicated in such a way that almost made it sound as if the near doubling of the price was being done just because they could. But the company either changed their mind or their messaging (maybe both) and though a price increase was still there, it wasn’t as big. It was actually reasonable. From an MSRP of $59.99 to somewhere between $69.99 and $74.99 wasn’t terrible considering the newly supplied explanation of constrained supplies and reduced numbers of batches. Unlike many others, I wasn’t angry. That’s capitalism, I thought. They are free to charge what they want and I am free to either buy it or not based on if I think the price is fair. But unfortunately, even though I thought that the latter price increase wasn’t too bad, a funny thing had occurred: the first announcement stuck in my head. And as such, in my mind, Booker’s moved from an affordable luxury at $50-60 (depending on the retailer) to a bottle that was priced in the range of limited edition bourbons that I only bought once per year or less. It wasn’t true, but that’s what I mean about hiding the grudge from myself. Obviously just by looking at the shelf I knew that I wasn’t going to need to drop a hundred bucks on a bottle. But for some reason, I never thought of it because that $99.99 price was stuck in my brain along with the hard feelings that came with how it had been originally communicated. But time passes. Grudges, even hidden ones, lose their sharp edges. And when the PR folks for Beam Suntory reached out to me to see what I was planning to do for Bourbon Heritage Month and offered a review sample of Booker’s, I took it. It had been a few years since I had purchased one and I thought it might be nice to see how it was coming along. This particular batch was named for the now famous “Kentucky Chew” method of evaluating a bourbon originally made famous by the brand’s namesake Booker Noe. It is essentially the practice of moving the bourbon all around your mouth so it gets into all the little nooks and crannies, with the effect of making it looking like you’re chewing your bourbon. The batch was released in August 2018. Purchase Info: This sample was graciously provided by Beam Suntory. The suggested retail price is between $69.99 and $74.99 for a 750 mL bottle. Details: 63.35% ABV. Aged for 6 years, 4 months, 12 days. Nose: Oaky notes of leather and vanilla. Spicy notes of allspice and cinnamon. Sweet notes of brown sugar and caramel. Mouth: Brown sugar and baking spices. Finish: Nice and long with a good “bloom” of heat and flavor after swallowing. Lingering notes of of green apple and baking spices. Thoughts: This is a great whiskey. Compared to other bourbons in it’s price range, this is still one of the best “regularly available” bourbons on the market. I think this bottle finally laid the last remnants of that hidden grudge to rest. I’ll be adding Booker’s back into the rotation of barrel-proof bourbons I buy.